The pre-feasibility study confirms the quality of the Arrow deposit. The stock is now at the lower end of a two-year range. Over the next 15-18 months, there is a lot of progress expected to be made that would take the company closer to production. NexGen Energy (NXE) is a long-term investment in the uranium market. The company is presently in the exploration and development phase. The fact that NexGen has the most impressive high-grade deposit (Arrow) in the market in one of the best mining regions could make the stock one of the biggest winners if or when we see a turnaround in the uranium market. Further drill programs at Arrow, likely more focused on increasing the confidence in the existing results rather than expanding the project. Getting regulatory approval on a federal and provisional level. The aim is to get this done by mid-2020. However, as with all exploration and development projects, there can be significant delays to the timeline. There are several factors which point to the fact that this could be achieved in a relatively short time period. Saskatchewan, Canada, where NexGen operates is an experienced and well-regarded mining region. The uranium mining industry is supported by the local people in the region. Arrow is also a concentrated high-grade discovery, which means operations can be reduced to a relatively small area that in turn could simplify the approval process some. During the fall of 2018, we saw the spot price of uranium recovering and moving closer to long-term contract prices. More recently though, we have seen a reversal in the spot price. Both spot and long-term contract prices are at extremely depressed levels in comparison to average cost of production and what we have seen historically. Uranium supply has been removed from the market, primarily from Cameco (NYSE:CCJ) and Kazatomprom. Japanese reactors are being restarted ever so slowly, and many emerging market reactors are being built, which can be seen in the below chart. How long it will take to work its way through to higher uranium prices, is still unclear. I do think the 232 petition which was filed in U.S. last year, might cause utility companies to hold off making any long-term contract decisions. While this will likely only affect U.S. producers and consumers directly, we could potentially see further movement on a global scene once this uncertainty is removed. The President's decision on this petition, if any recommendations are made, should be expected this summer. The pre-feasibility study was released during November of 2018 after my last article on NexGen was published. The scope of the Arrow discovery was well known before that, but the study included several positive takeaways. NexGen estimates the company will be able to recover much of the high-grade core in a shorter time period once in production. This will, apart from shortening the mine life and increasing the annual production, decrease estimated operating costs which are already at levels not seen elsewhere in the industry and produce a higher net present value. It is important to keep in mind that these are preliminary numbers which will hopefully be confirmed in 2020 when the feasibility study is released. It is also important to point out that Arrow is only one of the discoveries NexGen has and the company will likely continue exploration work in the surrounding area for many years to come, which can increase the value of the company. 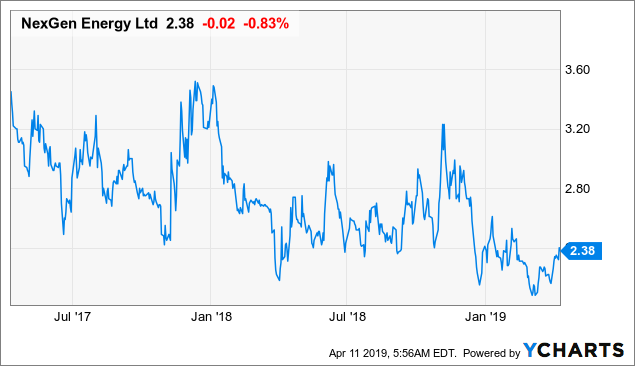 Given the fact that NexGen will be focused on exploration and development work for the next couple of years, the company will be less exposed to the current depressed uranium market. Having said that, the stock will likely move together with the rest of the uranium market to some extent. The market cap of the company is presently at C$837M, and NexGen will need to refinance the project likely sometime in 2020. 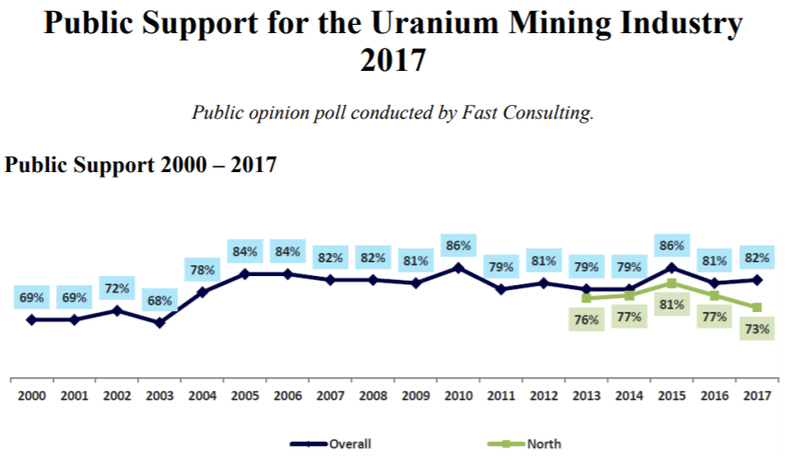 The more favorable the uranium and overall markets are at that time, the better the terms will be. Regardless, if the financing is done via equity, debt, convertible, partners or some combination of several sources. Some dilution to existing shareholders is expected. How much is very unclear at this point as future market conditions will define the financing terms. NexGen will need to convert indicated to measured resources, move through regulatory hurdles, and arrange financing. 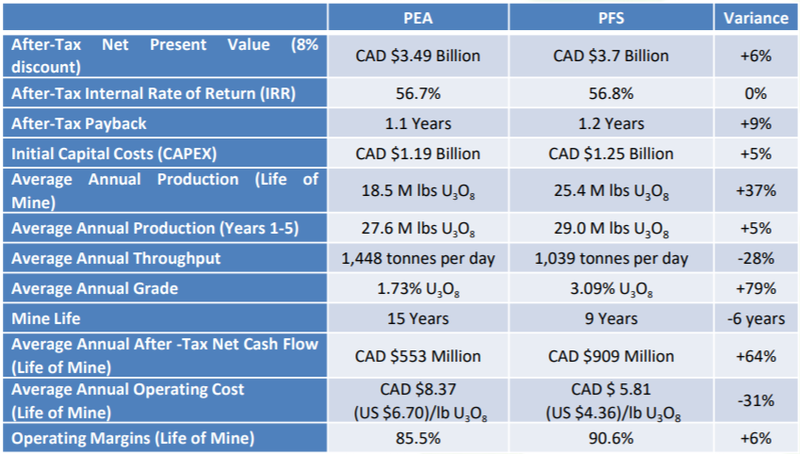 However, should the company achieve that, we will be looking at a very attractive return almost regardless of where the uranium price is, as all-in sustaining cash costs are estimated at C$11.77 per pound of uranium. Should the uranium market also recover by the time NexGen moves into production, which I expect it will, the returns would likely be fantastic. The company is presently trading at the lower end of a two-year range, which looks like an attractive entry point. I would emphasize that this is a long-term investment, which can take many years to pay off even if everything goes according to plan. 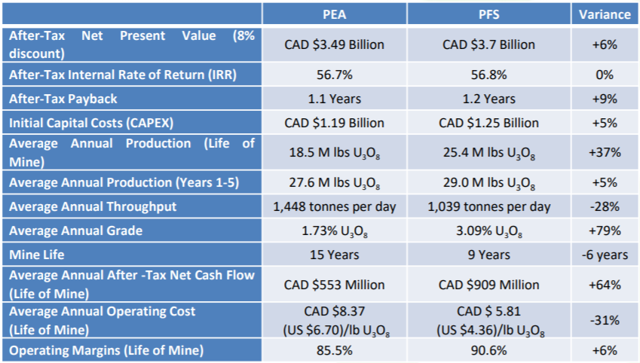 Given the increasing demand for uranium from emerging markets and what the company has produced so far, I think NexGen is one of the most attractive investments in the uranium segment. Disclosure: I am/we are long NXE. I wrote this article myself, and it expresses my own opinions. I am not receiving compensation for it (other than from Seeking Alpha). I have no business relationship with any company whose stock is mentioned in this article. Additional disclosure: I am long NexGen on TSX and I have recently increased my position.